Government of India recently launched a new scheme on subsidizing the HP gas cylinders. For that, the consumers need to link their bank accounts and Aadhaar cards with their LPG console to get the subsidy transferred to their account back just after the booking. When I booked the first cylinder, I was asked to pay for 803 INR and the subsidy amount got transferred to my bank account just after the booking was successful and got my cylinder delivered in just 2 days. This is really a great facility provided by the HP authorities to the consumers as one can just book the cylinder at home online, via SMS or via a simple phone call. How to link Aadhaar with HDFC bank online. In this article, I am going to help those who have linked their Aadhaar cards with their bank account but not with their LPG console connection or for those who have registered for the scheme earlier but got their Aadhaar cards delivered to them now. So lets us start with the step by step tutorial. Step 1: Go to the official website of the HP Gas i.e. www.hpgas.in from your PC or laptop (avoid registering via a smartphone). You will find the quick links in the center of the webpage as shown in the image below. Click on the highlighted link i.e. Transparency Portal (www.myhpgas.in). 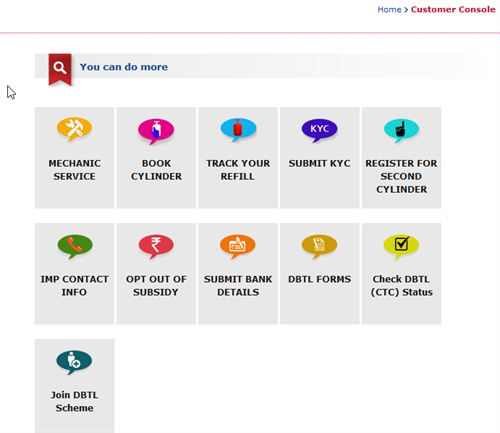 Step 2: After clicking on the above link, you will be directed to the DCMS transparency portal of HP gas where you can do anything related to your LPG gas connection. The top of the webpage you just opened will look like the below image. Step 3: Click on the 'New User' button and you will be redirected to the following page containing the search bars which you have to use to locate your dealer and your LPG connection console. So, proceed according to the instruction till you get an activation link on the given mobile number and email id. And once you confirm the email id or the phone number, you are registered with HP gas. Note: if you already have an account in this website, you need not to register again. You just skip the step 3 and instead click on the 'Sign In' button to get the webpage containing the options like in the image below. 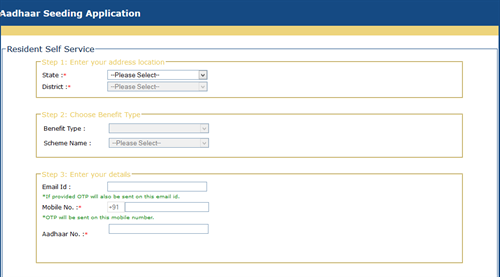 Step 4 In the middle of line of the options, you will find "Submit bank details" button. Click on it and you will be redirected to the next page containing some information linked to your account. In the bottom, you will see a clickable link like in the image below. Click on it. Step 5: After clicking on the above link, you will be immediately taken to the webpage containing the Aadhaar Seeding Form as shown in the image. Fill in the details properly and carefully and confirm your account via the OTP you receive on your mobile number or the email id (if provided). Once clicking on the confirm button, it should show 'seeding successful', which means you are all done. Just wait for few days and you will find your Aadhaar card linked with your LPG account. Linking your Aadhaar with the bank account and with your LPG console are two different things. I first provided the Aadhaar details to the bank and got it linked with it but when I logged in to my LPG account in the transparency portal, I found the status of my Aadhaar linkage as 'Not Available-Aadhaar card not linked'. I got worried but then followed the above steps and got my Aadhaar card linked with my LPG account without visiting the distributor or without filling any kind of offline form and decided to share those steps with those who need help regarding this matter. I also thought, why not take the advantage of the facilities provided to us on our own! Why to be dependent on others if you can do the things by yourself in just a matter of minutes. Further, if you have any queries related to the Aadhaar linkage with your LPG account, you can post them in the form of response below to this resources. Good piece of info for all those who needed to know about the DBTL scheme. Now that all these features have been digitalised, it is too easy to join the scheme without much hassles of having to run between your LPG and the bank. The article , however , should have given the links for other LPG service providers viz Bharat Gas and Indane. This article relates to the LPG gas scheme by Hindustan Petroleum association and there is no link between the companies You have mentioned. Further, linking to the other sources is not a good practice. I think the article contains a fair amount of information regarding what the title is indicating and there is no need of any sort of alteration according to my view.